↑ 1.0 1.1 1.2 1.3 1.4 1.5 "Chickenpox (Varicella) Signs & Symptoms". Centers for Disease Control and Prevention (cdc.gov). 16 November 2011. Archived from the original on 4 February 2015. สืบค้นเมื่อ 4 February 2015. ↑ 2.0 2.1 2.2 2.3 2.4 2.5 2.6 2.7 2.8 2.9 "Chickenpox (Varicella) Prevention & Treatment". cdc.gov. 16 November 2011. Archived from the original on 4 February 2015. สืบค้นเมื่อ 4 February 2015. ↑ 3.0 3.1 "Chickenpox (Varicella) Overview". cdc.gov. 16 November 2011. Archived from the original on 4 February 2015. สืบค้นเมื่อ 4 February 2015. ↑ 4.0 4.1 "Routine vaccination against chickenpox?". Drug Ther Bull. 50: 42–5. 2012. doi:10.1136/dtb.2012.04.0098. PMID 22495050. ↑ 5.0 5.1 GBD 2015 Mortality and Causes of Death, Collaborators. (8 October 2016). "Global, regional, and national life expectancy, all-cause mortality, and cause-specific mortality for 249 causes of death, 1980-2015: a systematic analysis for the Global Burden of Disease Study 2015". Lancet. 388 (10053): 1459–1544. doi:10.1016/s0140-6736(16)31012-1. PMC 5388903. PMID 27733281. 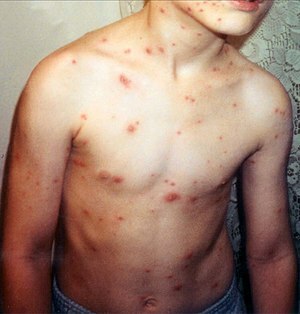 ↑ "Chickenpox (Varicella) Complications". cdc.gov. 16 November 2011. Archived from the original on 4 February 2015. สืบค้นเมื่อ 4 February 2015. ↑ 7.0 7.1 7.2 7.3 7.4 7.5 7.6 7.7 7.8 7.9 Atkinson, William (2011). Epidemiology and Prevention of Vaccine-Preventable Diseases (12 ed.). Public Health Foundation. pp. 301–323. ISBN 9780983263135. Archived from the original on 7 February 2015. สืบค้นเมื่อ 4 February 2015. ↑ "Chickenpox (Varicella) Interpreting Laboratory Tests". cdc.gov. 19 June 2012. Archived from the original on 4 February 2015. สืบค้นเมื่อ 4 February 2015. ↑ Breuer J (2010). "VZV molecular epidemiology". Current Topics in Microbiology and Immunology. 342: 15–42. doi:10.1007/82_2010_9. PMID 20229231. ↑ Flatt, A; Breuer, J (September 2012). "Varicella vaccines". British medical bulletin. 103 (1): 115–27. doi:10.1093/bmb/lds019. PMID 22859715. ↑ Macartney, K; Heywood, A; McIntyre, P (23 June 2014). 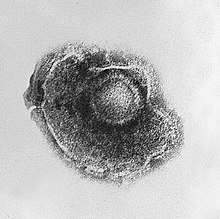 "Vaccines for post-exposure prophylaxis against varicella (chickenpox) in children and adults". The Cochrane database of systematic reviews. 6: CD001833. doi:10.1002/14651858.CD001833.pub3. PMID 24954057. ↑ Global Burden of Disease Study 2013, Collaborators (22 August 2015). "Global, regional, and national incidence, prevalence, and years lived with disability for 301 acute and chronic diseases and injuries in 188 countries, 1990-2013: a systematic analysis for the Global Burden of Disease Study 2013". Lancet. 386 (9995): 743–800. doi:10.1016/s0140-6736(15)60692-4. PMC 4561509. PMID 26063472. ↑ 14.0 14.1 Oxford University Press (December 2014). "chickenpox, n." oed.com. สืบค้นเมื่อ February 4, 2015. หน้านี้แก้ไขล่าสุดเมื่อวันที่ 19 พฤศจิกายน 2560 เวลา 07:45 น.